The first deployment of the V-1 was in June 1944 when, following two years of tests, Hitler gave the order to attack England. Known to the Allies as the "e;Buzz Bomb"e; or "e;Doodlebug"e;, the V-1 was the world's first cruise missile. 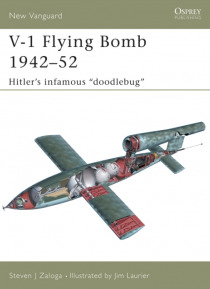 This book explores the V-1 in detail, from its initial concept, first use in 1944, the various Allied counter-measures, and the later use of the V-1 … during the Battle of the Bulge. The major foreign derivatives, including the US copy "e;JB-2 Loon"e; and numerous post-war Soviet variants, are also covered.